It is important that children are taught how to form letters correctly from the start. 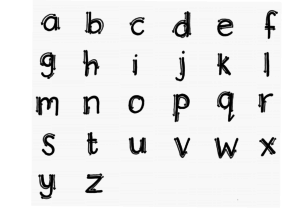 However, this does not mean that we focus on perfectly neat, well-formed letters when children first begin to write! 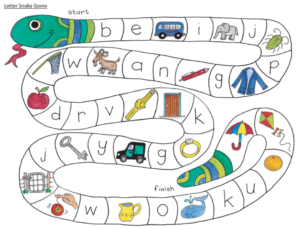 On this page, you will find fun ideas for teaching children how to form letters and an alphabet chart which you can print and use as a reference. 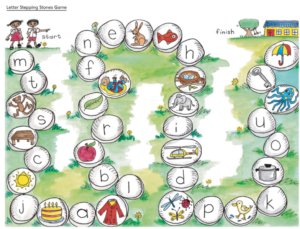 Use the alphabet chart to i ntroduce each new letter. Name the picture, then stretch out the beginning sound. For example, ‘Look at the snake…..ssssnake….snake starts with /s/. This is how you write /s/’. 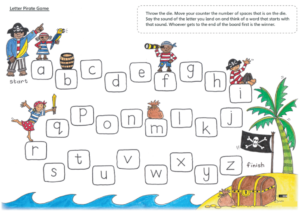 Use the letter formation sheet to show children the correct way to write letters. NOTE: Start off making letters with BIG movements and if children are in Grade R avoid activities that involve writing letters between lines on paper. Letter-boxes are a set of boxes filled with objects that begin with the same sound. 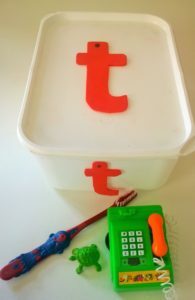 They are easy to make and are a fun way to teach letter sounds to children who are in Grade R and Grade One. 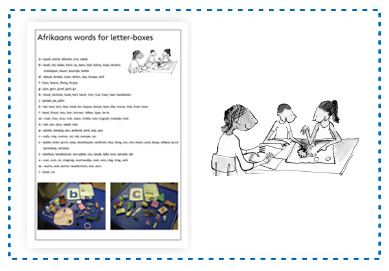 The letters on the box are a label for what is in the box and children can trace over the letter with their fingers. As they ‘feel’ the letters they build a greater awareness of each letter’s shape and form. It is also a great way to practise correct letter formation. Refer to the lists of suitable objects for the boxes. You can add your own objects to the boxes and can encourage children to bring things to add as well. It is not necessary to buy everything for the boxes. Instead, you can collect everyday things such as, stones, sticks, toothpaste boxes, leaves etc. NOTE: It is very important to check that objects start with the sound of the letter. For example, ice cream starts with a long /i/ sound and not the short /i/sound like in ink. Be careful not to add objects like shoe and shell to the /s/ box – they begin with a /sh/ sound and not a /s/ sound. NOTE: It is very important to focus on the sound that the word starts with, and not the letter. For example, the word ‘shop’ starts with the sound /sh/, even though the first letter is ‘s’. The word ‘children’ starts with the sound /ch/, even though the first letter is ‘c’. Good for: Improving letter-sound knowledge. The child throws the die and moves a counter around the board. The child must say the sound of the letter they have landed on and think of a word that starts with that sound. Whoever gets to the end of the board first is the winner. Download this game in Afrikaans. Download this game in isiXhosa. The child throws the dice and moves a counter around the board. If they land on a letter, they must say the sound and move their counter forward to a picture that starts with that letter. If they land on a picture, they must move their counter back to the matching letter. Whoever gets to the end of the board first is the winner. The child throws the dice and moves a counter around the board. The child must read the word that they land on (e.g. ‘see’) and make a sentence with the word (e.g. ‘I see a cat.’). Whoever gets to the end first is the winner. 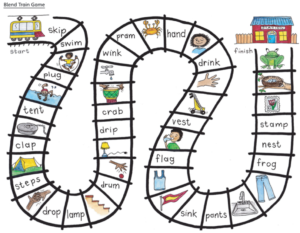 Good for: Practising reading simple three-letter words (CVC = consonant-vowel-consonant). The child throws the dice and moves a counter around the board. If they land on a word, they must say the word and move their counter forward to a picture of that word. If they land on a picture, they must move their counter back to the matching word. Whoever gets to the end of the board first is the winner. Download the snail game in Afrikaans. Download the snail game in isiXhosa. 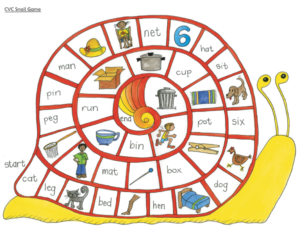 Good for: Helping children listen to each sound in a word and improving their writing skills. Place a picture card (e.g. cat) on the board in the large block. 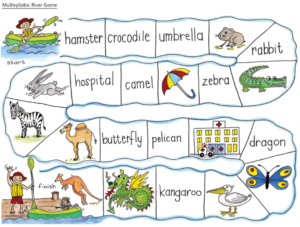 Help the child to name the picture saying the word slowly so they can hear each sound. Take 3 counters and show the child how to move a counter into a small block as they say each sound of the word (c-a-t). Work from left to right. Remove the counters from the blocks and give the child a whiteboard marker so they can write each letter in a block to make up the word. Good for: Improved reading of sight-words (commonly used words that can be hard to sound out). The child throws the dice and moves a counter around the board. They must read the word they land on (e.g. 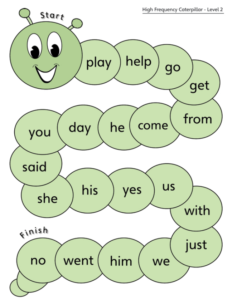 ‘come’) and make a sentence with the word (e.g. ‘Come and play with me.’) Whoever gets to the end first is the winner. 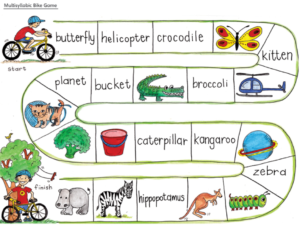 Download the Caterpillar game in Afrikaans. 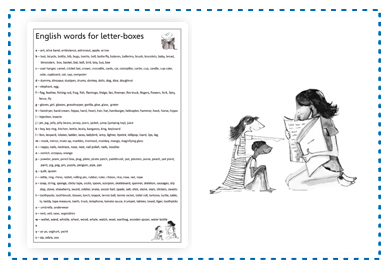 Good for: giving children practice reading longer words with blends. Blends are words with two consonants at the beginning or the end (eg. frog, nest, stand). The child throws the dice and moves a counter around the board. If they land on a word, they must read the word and move their counter forward to a picture of that word. If they land on a picture, they must move their counter back to the matching word. Whoever gets to the end of the board first is the winner. 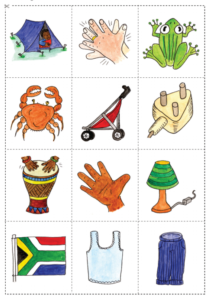 Download the Lily pad game in Afrikaans. 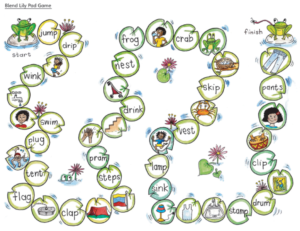 Download the Lily pad game in isiXhosa. Download the Train game in Afrikaans. Download the Train game in isiXhosa. 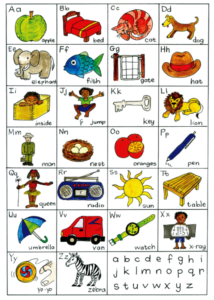 Good for: Helpin g children hear and write each sound in a word with a consonant blend. Blends are words with two consonants at the beginning or the end (eg. frog, nest, stand). Place a picture card (eg cat) on the board in the large block. 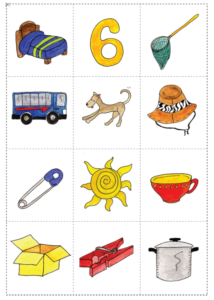 Help the child to name the picture saying the word slowly so they can hear each sound. Take 3 counters and show the child how to move a counter into a small block as they say each sound of the word (c-a-t). Work from left to right. Remove the counters from the blocks and give the child a whiteboard marker so they can write each letter in a block to make up the word. 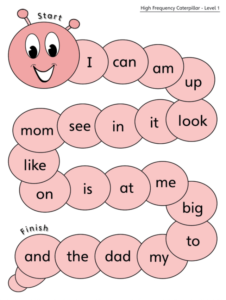 Good for: Improving reading sight-words (commonly used words can be hard to sound out). The child throws the dice and moves a counter around the board. Help them read the word they land on (e.g. 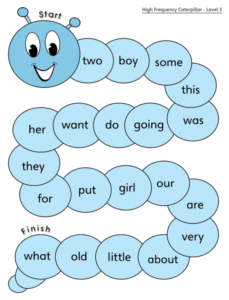 ‘come’) and make a sentence with the word (e.g. ‘Come and play with me.’). Whoever gets to the end first is the winner. 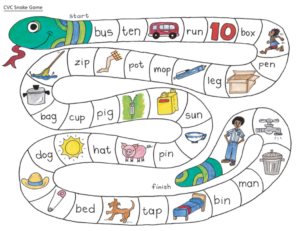 Good for: helping children sound out longer words and break them up into parts. The child throws the dice and moves a counter around the board. They must read the word they land on and move their counter forward to a picture that matches the word. If they land on a picture, they must move their counter back to the matching word. The child who gets to the end of the board first is the winner. The child throws the dice and moves a counter around the board. They must read the word they land on and move their counter forward to a picture that matches the word. If they land on a picture, they must move their counter back to the matching word. The child who gets to the end of the board first is the winner. 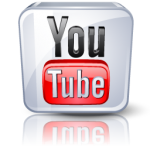 Watch the instruction video.